Flying Blind, LLC accepts all major credit cards, PayPal transactions, and Bank Certified Checks. One BrailleSense 32 for US$2,995.00! This is an amazing bargain which offers you a hardly used, 32 cell, state-of-the-art notetaker for over 40% off its suggested list price. It’s the only notetaker on the market with a built-in visual display along with an attachable battery that can be easily replaced. And, the BrailleSense’s countless applications allow you to independently complete everyday tasks while enjoying a variety of audio and Braille media. One Brailliant 24 for US$1,995.00! This 24 cell Braille terminal is the perfect display for individuals requiring portability while offering enough Braille cells to access either a laptop PC or an accessible cellular phone. This unit offers both USB and Bluetooth wireless connectivity, and ships with a 90 day extended warranty. 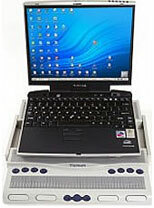 One Braille Voyager 40 Cell Refreshable Braille Terminal for US$1,895.00! We are selling this Braille Voyager Terminal for over 50% off its suggested list price! This economic solution for professionals "on the go" is being sold for almost 50% off its suggested retail price. It’s USB interface enables the user to use the display without a power supply on either a laptop or desktop PC, and its ergonomically positioned Braille keys and thumb-keys enable the user to perform most navigation commands without moving his/her hands from the Braille display, thus maximizing the user’s productivity. If you represent a manufacturer, agency, organization, or conscientious user of Adaptive Technology wishing to have your previously operated technologies represented in a future E-Blink ShowCase, please contact us at E-Blink@Flying-Blind.com to discuss placement within future Flying Blind, LLC Newsletters.